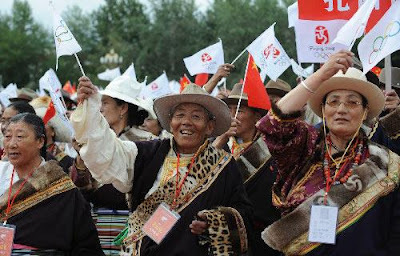 The China Beat: Whose Peoples’ Games? With the self-professed slogans of the Green Olympics, High-tech Olympics and the People’s Olympics, the Beijing Organizing Committee for the Olympic Games (BOCOG) should have anticipated criticism. It left nothing to chance in hosting the world’s athletes and spectators—gleaming stadia, smiling faces and blue skies: all as ordered. But as many Western observers noted, BOCOG forgot to invite the Chinese people—with security guards, CCTV cameras and robot-like volunteers ensuring little spontaneity or popular emotion at the so-called People’s Games. In the wake of the unprecedented media coverage of China’s global “coming out party,” few have paused to consider who and what were on display at Beijing 2008. In the pomp and pageantry of the most expensive Olympic Games in history, whose image did the organizers project before the world’s probing gaze? In promoting the Olympic Games and Olympic Movement, BOCOG promised to “organize diversified cultural and educational programs to cater to the needs of the people,” while encouraging “the widest participation of the people in the preparation of the Games” in order to “increase the cohesion and pride of the Chinese nation.” But a closer look at the preparations and staging of the Games reveals deep strains in the very fabric of the Chinese nation, not only the fraying threads of class, place, and gender, which have been often commented on, but also of ethnicity. It has become commonplace in academic literature to speak about the “inchoate,” “incoherent,” and “amorphous” nature of Chinese nationalism, what John Fitzgerald termed a “nationless state,” a fractured and divided people forcefully held together by an autocratic state structure. Unlike Europe, state and nation building in modern China occurred alongside one another, with an increasingly powerful state elite experimenting with different formulae for the nation: who was to be included, in what proportions, and under what terms. Here the ethnic composition of the nation-state proved particularly problematic. China is home to both a single, dominant Han majority—whose over one billion people are beset by numerous linguistic, cultural, class, and place divisions—and scores of small and highly scattered minorities living along the state’s massive frontier regions. In the making/baking of the nation-cake, we can identify at least three distinct, yet overlapping, recipes in the Chinese cupboard over the last century or so. What I will term: 1) Leninist-style multiculturalism; 2) Han racism; and 3) Confucian ecumenism. It is important to note that each of these recipes explicitly excludes the possibility of ethnic separatism and transnational ties. The nature and size of the baker’s bowl was never really in question; rather the modern Chinese state and its elites inherited the Qing geobody and set about constructing the nation from within its boundaries. Yet while the contours of the nation-cake were largely fixed, its ingredients were open for debate. In what follows, I seek to tease out some of these unresolved tensions, and explore how they were reflected on the stage and behind the scenes of China’s Olympic moment. As a Leninist party-state, the People’s Republic of China (PRC) sought initially to solve the “national question” in accordance with the “scientific laws” of historical materialism. Material progress was viewed as a linear path; but not all peoples were thought to progress at the same rate, leaving the problem of “backward and feudal national minorities” for the state to resolve. Lenin’s solution, as outlined in the 1903 program of the Russian Communist Party, was “the right of self-determination for all nations comprising the State”; that is, the strategic recognition and protection of individual nationalities’ interests within a multi-ethnic state structure. While Mao and the Chinese Communist Party (CCP) were quick to rule out the possibility of territorial succession for China’s minorities, they followed the Soviet Union in creating a complex system of cultural, economic, and political autonomy to protect the independent development of each nationality free from ethnic chauvinism. In the PRC today, Leninist-style multiculturalism includes an intricate series of affirmative action policies aimed at preserving the cultures and identities of each of the state’s fifty-five officially recognized national minorities. In this spirit, 42 of China’s 639 Olympic athletes in 2008 were non-Han competitors who managed to win 6 of China’s 100 medals. And while not all Chinese nationalities competed at Beijing, a colourful caricature of this ethnic mosaic was ceremonially paraded across the Bird’s Nest stadium at the start of the Opening Ceremony. 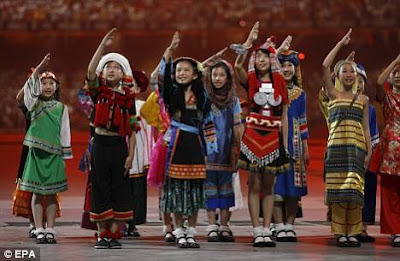 Despite the tightly controlled nature of minority participation in the Games, the official policy of multiculturalism required a degree of visibility and active participation from the minorities, including thousands of torch bearers (including 22 Tibetan mountaineers on the slopes of Qomolangma), ethnic singing and dancing at Olympic events, and extensive media coverage of the 9th National Minority Nationalities Traditional Sports Games held in Guangzhou in November 2007. Foreign visitors were also encouraged to visit the recently completed “Chinese Ethnic Culture Park,” a 50-hectare “anthropological museum” located just south of the Olympic Green where visitors could experience real, live “ethnic gatherings,” and learn more about the “behaviour, genius, liability, aesthetics and cultural essence” of the minorities while wandering through the individual “ethnic villages” that have been authentically preserved by the Chinese state. Following the collapse of the Qing, this sort of racial vilification was swept under the rug of the new Republic and its idealized “Union of Five Races” (Han, Manchu, Mongol, Tibetan, and Hui), and was later attacked as “Han chauvinism” by the CCP. But the party-state has struggled to completely stamp it out. If anything, the collapse of ideology and the rise of new communication technologies in China have provided alternative platforms for its articulation. In its moderate form, Han racism identifies the Han people as the cultural and racial backbone of the nation, mandating the Han man’s burden of civilising the “backward” and “feudal” minorities. 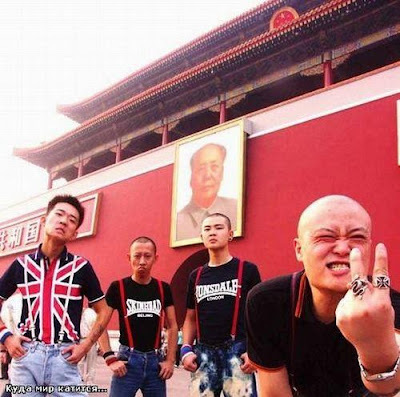 In its more virulent articulation, Han racism advocates the forced assimilation or extermination of all non-Han peoples in China, an ideology that one online blogger termed “Chinazi” (China + Nazi = Chinazi) in admiration of Nazi-style racism while calling for the preservation of superior Han blood from barbarian contamination. This sort of chauvinism is largely hidden and subconscious. 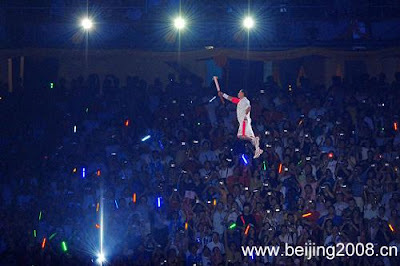 Take for example, the use of Han actors to portray the minority children at the opening ceremony. Facing criticism from the foreign media, BOCOG vice-president Wang Wei dismissed the incident as “not worth mentioning” and “completely normal” in Chinese tradition. 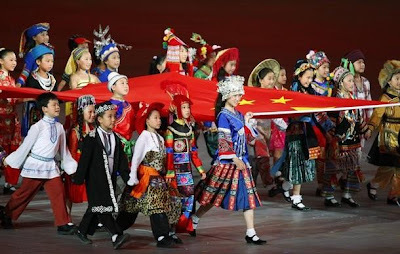 But few Chinese would have missed the powerful symbolism of a red-dressed Han girl singing the emotive “Ode to the Motherland” (gechang zuguo) from an elevated stage as the colourful “native” children paraded before her and the all-Han BOCOG officials before saluting the motherland’s flag. It would seem that the Han man’s burden was nearly fulfilled; but not all bloggers were happy. 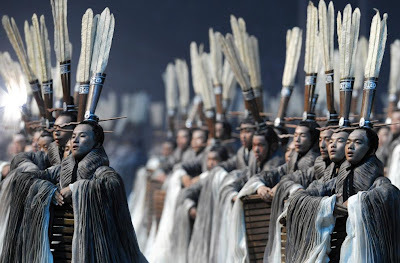 Several complained about the Han girl’s Western style dress and the Manchu derived “horse jacket” (magua) and “riding gown” (qipao) that other Han performers were wearing. These foreign styles, it was claimed, diluted the traditional essence of Chinese (zhonghua) culture embodied in the long silk robes of Han clothing (hanfu). Yet, outside the carefully controlled public arena, one finds more explicit expressions of Han racism. Following the March 14th riots in Lhasa, which killed 18 and injured over 500 mostly Han migrants, racist diatribes inundated popular Chinese blogs before being removed by censors. When discussing the vitriolic Song dynasty war song, “Defend the Han Homeland” (hanjia jiangtu) on Han Minzu BBS, a retired Beijing solider asserted that “national unity and fusion can only be achieved through struggle and not compromise,” and “because we Han give them preferential treatment, some national minorities now think they are naturally superior to the Han and discriminate against us, even to the extent of disrespecting our people’s history, customs, habits and traditional clothing.” Others used much less subtle language. Throughout the long sweep of its history, racial exclusionism has been a distinct yet largely heterodox tradition. During times of strength and unity, the Chinese state stressed the ability of its culture to literally absorb neighbouring “barbarians” through a peaceful process of laihua (come and be transformed), incorporating them into the Confucian datong (great community) or tianxia (all under heaven). More recently, the colonial extension of the Chinese state has pushed its institutions and people into the furthest corners of the geobody, ensuring that few regions are not actively guarded over by Han soldiers, bureaucrats, teachers, or entrepreneurs. The demographic and political weight of the Han community has led some intellectuals to begin to question the official policy of multiculturalism, calling for a revival of what they see as an ethnically neutral Confucian ecumenism. Take for example, the US-educated Chair of Sociology at Peking University, Professor Ma Rong, who speaks with the authority of the Han state despite his Hui ethnicity. In a recent article, he called for the “de-politicization” of ethnic relations in China, which requires a departure from European-style liberalism and Soviet-style multiculturalism and a return to a traditional “culture-centred” approach to diversity that is fundamental to his reading of Confucianism. Rather than promoting ethnic integration, Ma Rong argues that the “institutionalization of ethnic groups” under Mao Zedong promoted ethnic stratification and tension. In response to Western criticism, China should “learn from their ancestors and their experience for thousands of years in guiding ethnic relations,” and return to the bedrock of Confucian “culturalism,” where culture rather than ethnicity serves as the key marker of civilisation and public policy focuses on promoting a universal culture and identity through acculturation rather than the protection of individual minority rights and benefits. Confucianism and its idealized “harmonious society” were a dominant theme at the Opening Ceremony. Despite the brief nod to multiculturalism, it was Confucius in the form of 2008 Fou drummers who welcomed guests with the opening lines of the Analects. They were followed by 3000 Confucian disciples and the repeated creation of the Chinese character for “peace” (he) as organizers sought to convey Chinese culture and its people as an ancient and outwardly looking civilisation. Riding a wave of renewed interest in Confucianism and the establishment of thousands of international institutes bearing his name, many Chinese hope that Confucius will one day rival Socrates’ influence on global thought. Confucian ecumenism and its ethnic double blind were perhaps best symbolized by the Ceremony’s two leading (genuine) minority performers: the 15th century Hui Muslim admiral Zheng He and the Zhuang nationality gymnast Li Ning. While the Great Wall made only a fleeting appearance, the Silk Route and the “Maritime Silk Route” of Zheng He’s famous sea voyages took centre stage. 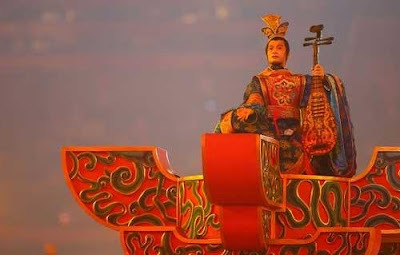 As an armada of blue-robed performers swung massive wooden oars across the stadium floor, foreign television commentators waxed lyrical about the seven treasure fleets of this “Chinese Columbus,” who spread Chinese culture and goods as far as Africa and possibly beyond. 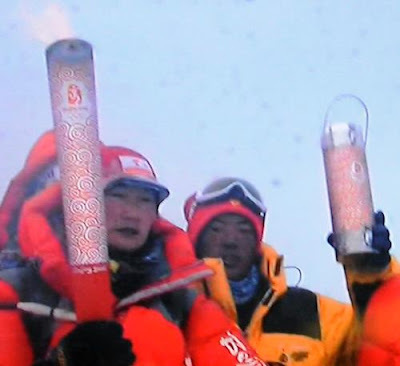 The day started with the lighting of the Olympic torch next to a bust of Peking Man at Zhoukoudian and ended when the Olympic cauldron was set ablaze by Li Ning. Failing to mention his ethnicity, the People’s Daily described him as a “Chinese gymnastic champion” and “national hero” who won 6 medals at the 1984 Los Angeles Olympic Games and then went onto become a millionaire entrepreneur in Reform era China. In representing both the traditional and modern faces of China, these two “Chinese” figures signified the great coalescing force of Confucianism and its ability to fuse different peoples into a powerful, cohesive whole. In contrast, there appears to be great sympathy for a new approach to ethnic relations among the Han elite, and here Confucian ecumenism seems to offer a distinct alternative, or at the very least a new indigenous grammar. But shifting rhetoric is easy; transforming institutions is not. Dismantling the complex structures of Leninist-style multiculturalism would require bold action. Not only are the state’s basic institutions—government, education, media, police, and military—organized to reflect and respect the individual diversity of China’s 56 nationalities, but, perhaps more importantly, any attempt to unwind these institutions would meet with harsh criticism from the West and the withdrawal of the validation that China seems to crave. In seeking the moral high-ground on controversial issues such as Tibet and Xinjiang, China still feels compelled to argue its case in the language of the West: be it the Hegalian “politics of recognition” or the Nietzschean “war on terror.” Confucius might have welcomed the world to Beijing, but Count Jacques Rogge sent them home. Dr James Leibold is a Senior Lecturer in Politics and Asian Studies at La Trobe University and author of Reconfiguring Chinese Nationalism (Palgrave Macmillan, 2007). A copy of the text with references is available from the author at j.leibold@latrobe.edu.au. This is a rare piece of matter-of-fact, non-opinionated analysis from a westerner. The depth of the author's understanding and the cold way he presents it are almost terrifying. It doesn't offer cheap "solutions" or conclusions, instead it raises many questions that go beyond China. For example, the United States considers itself a "melting pot" of multiple cultures, which is clearly a much more successful model than the Soviet multicultural model. 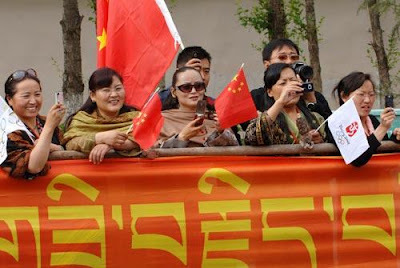 Yet merely suggesting that China may adopt such a melting pot approach should chill the Tibetan activists to the bone. I don't see why the Chinese would want to or need to adopt a US style melting pot. The future is open, who knows what can emerge, good or bad. Since it is a top-down approach expect much more experimentation ahead.